Digital Marketing Strategy – What Is It and Why Is It Important? Goals – Objectives – Strategy – Tactics – what does this mean and why it is important to your business? These four words are not one in the same. They refer to different aspects of the planning and growth process of your business. 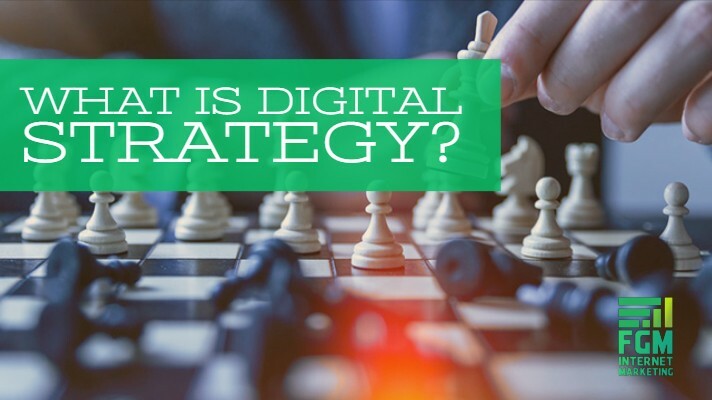 In this post, we’re going to focus on digital marketing strategy, what this means, and the individual aspects of a robust digital marketing strategy. Clearly defined, strategy is a plan of action to achieve a goal or a set of goals. If your business goal is to increase sales by 20% in 2019, what is your plan of action to accomplish this? You could tell your sales team to sell more, but hopefully your sales team is already selling at their capacity (if not, that’s an HR problem). In order to be successful at accomplishing your sales goal, you need to look at every aspect of your business, define the challenges, apply your company’s guiding principles in how you tackle these challenges, and lay out a set of coherent actions to accomplish your goal. Sounds intimidating, right? It doesn’t have to be. Here are the aspects of a digital marketing strategy that will help you discover, define, and defeat your challenges. Developing customer profiles is one of the best ways to define your target audience, understand their pain points, and how your product or service is beneficial to them. Without this, it’s just a shot in the dark as to whether your marketing message resonates with your target audience, and whether it persuades them to purchase from you. A customer profile is a rounded picture of an individual who purchases your product or service. You can have multiple customer profiles, but try to avoid lumping all of your customers or prospects into one customer profile. Johnny buys your product for one reason, Susan buys it for another. You have to understand both Johnny and Susan’s motivations, and realize that your marketing message may need to be different for each of these people. Where do you get this information? It’s important to note that this information should be based upon real data wherever possible as making assumptions about your audience can cause your marketing strategy to take the wrong direction. Do research, send surveys, interview your current customers, and consider a focus group. Write down your business goals. This is probably the step that 90% of small businesses never do. For many of us, we started our business so we could pay the bills. That started us on this never-ending treadmill of trying to keep the lights on, but deep down, there are some goals in there somewhere. If you want your business to gross $10M or more this year, write it down! That is your focus, and from there, you can define your key performance indicators (KPIs), figure out what tools you need to measure success, start benchmarking, and move that dial to get you closer to your goal. With digital marketing, there are so many measurement tools, it can be overwhelming. If you are an e-commerce business, tracking success would include tracking the number of sales on the website, tracking your traffic numbers to the website, and determining your conversion rates for visitor to sale. These metrics are your KPIs. You should be able to look at these over time to see if you are heading in the right direction, or if you need to make some changes to get back on track. Owned Media – digital assets that your business owns and has complete control over. This would include photography, your website, social media profiles, blogs, and videos you’ve produced. Earned Media – this is exposure you’ve earned through word-of-mouth and that other people control. Examples include online reviews, mentions in blog posts and press, or people sharing your content on social media. Paid Media – this is exposure that you pay for. This includes ads on social media, Google Ads, display advertising, and native advertising (like paying for posts on other websites). Create a list or spreadsheet so that you have all of your marketing channels in front of you. Now, look at what this is doing for you. If you have a landing page that creating a bunch of leads, can this landing page be shared on social media or promoted elsewhere? If you spent a lot of money on Google Ads but didn’t see a direct return in investment, is it time to reduce the budget or cut this channel all together? These are the tough questions you must ask yourself. We’ll examine these in more detail below. Your owned media are the only digital assets that you have complete control over. This includes your website, blog posts, paid-for photography, and video assets. All of your owned media should line up with the mission of your company, your ethos, and be driving you towards the business goal that you wrote down earlier. When you evaluate your owned media, you might be surprised that some of it isn’t in line with your marketing objectives. It’s easy for this to happen when goals have changed over the years, and you have multiple people producing content for you. Eliminate any owned media that is not helping you reach your goal. Identify gaps in your digital assets. Looking at your customer profiles, do you have content that speaks to each one? If not, it’s time to create a plan to speak to this customer. Does this include video, blogs, or other content? Create a content plan. Content is not something you publish once a year. With the speed of the internet and the world we live in today, content needs to be created on a regular basis. That can be a daunting task, but a well-thought-through content schedule can make it easier. Are you publishing a blog once a week or once a month? What will this month’s topic be? This topic should be in line with your business goal and the ethos of your company. Take a look at the earned media you’ve received over the past few years. Did a guest post on a larger website drive a lot of traffic back to your website? Did handing out review cards increase the number of positive online reviews you received? Did people share a certain type of post over others? This will help you focus on what works and what doesn’t work. Earned media can take a lot of legwork so you want to make sure the effort your putting into it is worth it. I feel like this almost goes without saying, but you should always be evaluating your paid-for media to see if it’s producing. Gone are the days of buying a quarter page ad and hoping it gets you some new customers. Digital marketing can be traced and tracked from the number of impressions, placements of ads, clicks, and conversions on your website. If a paid-for channel is not working, take a look at why. Is the landing page this issue? The ad copy? Ad image? Budget issues? Or does this channel need to be scrapped all together? Your digital strategy should then plan out how all of these pieces will play out in the next year or two. Take into account your natural business cycles. If summer is a slow time, maybe this is the time to focus on putting out more content to draw in more prospects. Or if you have a product launch in March, you should be planning out every bit of content that needs to be created and published leading up to that product launch. Does it all seem too much? For a time-strapped business owner, it certainly can. If you’re serious about achieving your business goals, you may want to consider hiring a digital marketing strategist or company. FGM Internet Marketing takes all of our clients through this process in our Discovery & Strategy meetings. From this process, you will receive a custom digital marketing plan for your business. It takes an investment of time and money, but it’s guaranteed to get you to your goal faster, and save you money by focusing your budget on efforts that are more likely to produce results. Questions about this blog post or our services? Contact us at info@fgminternetmarketing.com.